I swear I made this on time. My new years resolution is still going strong. But, this will be short and sweet due to lack of hours in the day (well hours in the day that my boys are asleep while I am awake). Cream 5 tbs. butter and 3/4 cup agave nectar don’t worry if you cant get out all the lumps. Then add in two eggs and whisk until somewhat smooth. Stir in 2 finely grated carrots and 3 mashed overripe bananas. Stir in sifted 1 1/4 cups whole wheat flour and 3/4 cup of all-purpose flour sifted with 2 tsp. baking soda. Put into a greased bread pan and bake for about an hour at 350. You might find you need to cover it with foil at the end if it gets too brown. EAT! 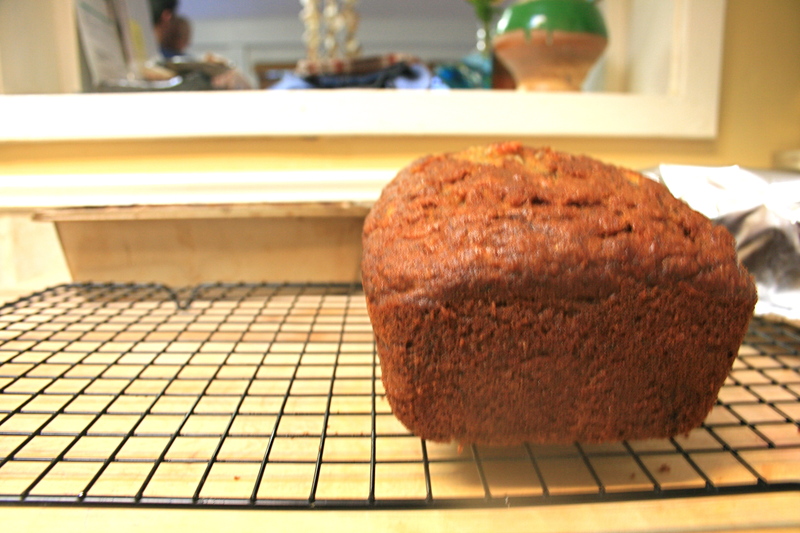 This entry was posted in the year of bread, Uncategorized and tagged banana bread, healthy bread, new years resolution. Bookmark the permalink.